We see dog dandruff in almost all dogs at one time or another. Some dogs, like Bichon Frises, are more prone to food and skin allergies and the inevitable dry flaky skin. Most cases of dandruff in dogs are simply dry dead skin cells that are being shed. It is not a health problem but is simply a cosmetic issue affecting how your dog looks. When you have dandruff, things can get really itchy! Because of their white color and thick coats of hair, Bichons may not show their dandruff as easily as short-coated dogs like Doberman Pinschers, Weimaraners and Vizslas. But, even though you can’t see the dry skin flakes, they are still itchy and irritating! Simple dog dandruff tends to get worse during the winter months when the air humidity is low, and it is less of a problem in the summer months. Occasionally dandruff is caused by a medical issue like a hormonal imbalance or a thyroid disorder. Or it could be caused by mites that have infected your dog. Why do dogs get dandruff? Should you be concerned about your dog’s dandruff affecting you? Most cases of dog dandruff are similar to human dandruff, in that they are itchy, flaking skin that loosens and falls off. Because the areas affected are itchy, you may see your dog biting or scratching. If your dog bites and scratches enough, he can end up with a yeast or bacterial infection. So it’s a good idea to get rid of the itchy dandruff when you find it. Will your dog’s dandruff affect you? Dog dandruff is not contagious and generally does not affect people, even though it is not pleasant to see and you certainly don’t enjoy having it drop on your furniture and carpets. But dog dandruff is not harmful to you, unless you are allergic to dogs. Usually a dog allergy simply means that you are allergic to the dander (or dandruff) on dogs. If you are allergic to dogs, you might even need to have someone else bathe and groom your dog. 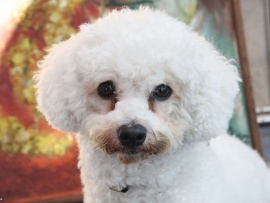 Bichon Frises are hypoallergenic dogs, meaning that they are less likely to cause a reaction in humans. But it doesn’t mean that they won’t ever cause one. Of course you should be grooming your Bichon Frise daily anyway. But, just in case your aren’t, you should brush your Bichon daily, at the least. Not only does it keep her looking attractive and well cared for, it also helps to prevent dandruff in dogs. Brushing your dog’s hair gets rid of loose hairs and dead skin cells, and it helps distribute the natural oils in your dog’s skin. These oils help keep your dog’s skin and coat healthy. When brushing your dog, use long brush strokes to eliminate the dead skin cells and to distribute the oils. In addition to brushing your dog frequently, you should wash her regularly. This varies with the seasons. In the winter, give your dog a bath once or twice a month and in the summer you can give him a bath every week. If your dog is really covered with a bad case of dandruff, you might want to do it more often—even twice a week until you get the unsightly and itchy dandruff under control. Bathing your dog is good for her, and it reduces the amount of dander or dry skin cells. It does not dry out her skin and coat, as many people believe. Perhaps the reason that people believe this is because they use the wrong shampoo. You should never us a shampoo on your dog, that was meant for people. Even the highest quality shampoos have the wrong pH factor for dogs. Human medicated shampoos like Head and Shoulders can cause your dog’s skin to dry out and produce more dandruff, in the end. So what should you use on your dog? When bathing your dog, you should use a gentle, high quality dog shampoo. Lather your dog up well and massage the shampoo into her hair. Use cool water for your dog’s bath, because it is more soothing and does not make her itchier. Make sure you rinse your dog completely. Your dog will feel better after her bath, and after a few baths, you should see fewer and fewer flakes. If your dog continues to flake, try using a dog conditioner to help things along. Pro Pet Works Oatmeal Shampoo – Oatmeal is very soothing and helps with healing. This shampoo also includes conditioner with aloe vera, also soothing and healing. If your Bichon has allergies, this could be a good choice. Earthbath All Natural Pet Shampoo – This pet shampoo was made to be gentle and it relieves itching. It is soap-free, biodegradable and recommended to relieve skin irritations and for re-moisturizing dry skin areas. Pet Bath and Massage Brush – Using a massage brush will help you stimulate your Bichon’s skin and get rid of built-up dandruff flakes in her thick coat. It also feels so good to your dog! Or you may want to try using bath/massage mitts on your dog. Lillian Ruff Oatmeal Conditioner – Has soothing oatmeal to calm down your dog’s itching and redness. Moisturizes her skin and can be used even if she is ultra-sensitive. Perhaps your dog’s dandruff problem is a bit more complicated. If so, you might want to consider some dog supplements to help you get it under control. Dogs need linoleic acid in their diets for a healthy skin and coat. Ultra Oil Skin and Coat Supplement – Made from Hempseed, Flaxseed, Grapeseed and Fish oils and it provides the Omega 6 and Omega 3 fatty acids pets need for healthy skin and a shining coat. Comes as a liquid with a pump on the bottle. This supplement does not have a fishy odor. Point Pet Omega Oils for Dogs – If you prefer giving your dog a treat supplement, this one is chicken flavored and soft. There’s no risk, as the company offers a 30 day, 100% money back guarantee that you will be happy with their product. Especially if your dog has some really bad skin areas with redness, swelling and extreme itching, you might also use a topical product that you apply to the worst areas. Coconut Oil – can be gently rubbed onto the skin, and it is completely safe if your dog licks it off. In fact, coconut oil is very good for dogs! Oatmeal and Baking Soda Spray – Oatmeal is very soothing, and baking soda has been used for years to relieve itching. You can spray this on the worst areas, knowing that it is safe for sensitive skin. Guaranteed to work. Make sure your dog’s diet is healthy! Encourage your dog to drink plenty of water. In some cases, dehydration leads to dry skin and dandruff. Dogs, like people, get dry skin in the winter when the air in your home is dry. If your home is really dry in the winter, consider running a humidifier, for both you and your dog! To make sure that water is always available, you might have water bowls in several rooms of your home. Dogs like fresh water, and, if your dog is not a drinker, consider getting a water fountain to make drinking water more interesting. Also make sure that your dog is eating a healthy diet, as some cases of dry skin and dog dandruff are caused by a poor diet.